I got this one in the same blaster I posted yesterday but I thought it deserved it's own post. See I do honestly like these mini's. Shocking. Check out this Ian Kennedy 1972 Mini. It's probably my favorite card I've gotten out of 2013 Topps so far. 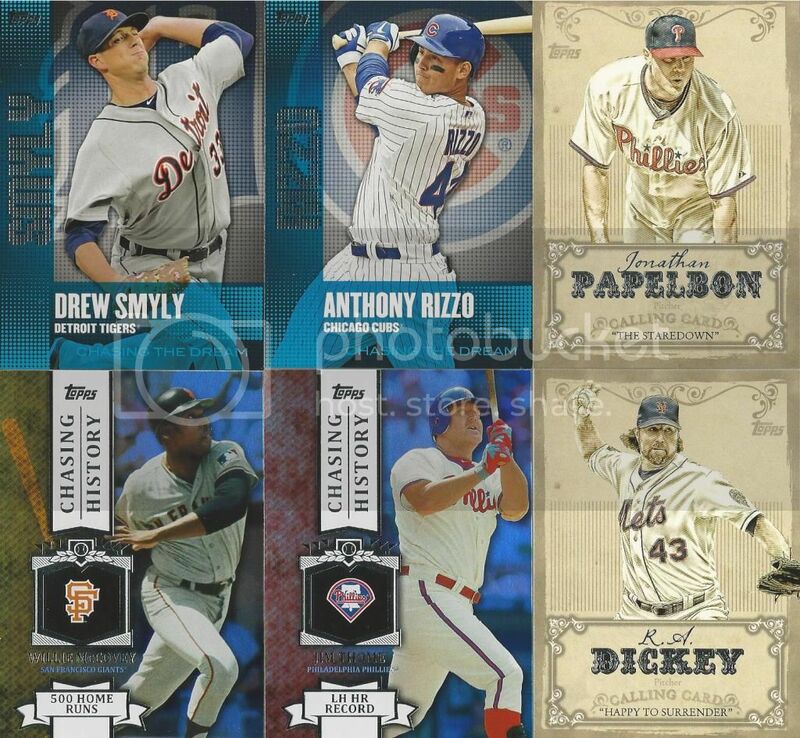 I'm thinking about heading over to my LCS on Friday to get a few packs. So much for sticking to one blaster. I stopped at Wal-Mart on my way home from work today to hunt for 2013 Topps. I found my pot of gold at the end of the rainbow. I limited myself to a single blaster but I like what I got. The base cards are nice. Tons of cool photos. I like the 1972 mini's a lot more than I thought I would but the rest of the inserts are a little boring. I'm not sure how I feel about the emerald parallels yet. I did okay on the commemorative patch. Hello, Mike Trout! I have a few new Daniel Hudson cards to catch up on. This mini from the 2012 Gypsy Queen set. It's numbered 5/10 on the back. I normally don't go crazy for mini cards but I couldn't pass this one up. I found this Luis Aparicio coin when I was going through some of my dad's stuff before Christmas. It's been riding around with me in my car since then. I've finally brought it inside and scanned it. These are pretty cool. I remember my dad gave me a few of these when I was younger. I remember liking them. 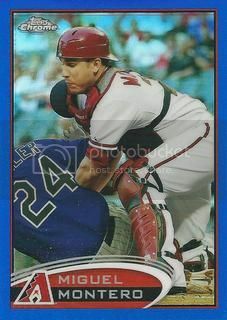 I don't think I had this one but I do remember playing with the Aparicio All-Star from this same set. I think my dad had bought this specific coin fairly recently. It was in a box with a bunch of others most of which were in rough shape. I remember him being disappointed when they showed up and were pretty ugly. This one's not bad. Just a little minor wear. If anyone is collecting these I probably have some extras if you're interested. I'm not sure who else was in that box but I can check. I won this one off eBay for just over $2. 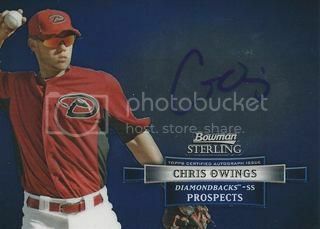 It's a Chris Owings certified autograph from the 2012 Bowman Sterling set. I'm glad it didn't cost much because I really don't like this set. Not only did it scan dark, it's dark in person. You can barely make out the signautre. Kind of drab and boring if you ask me. 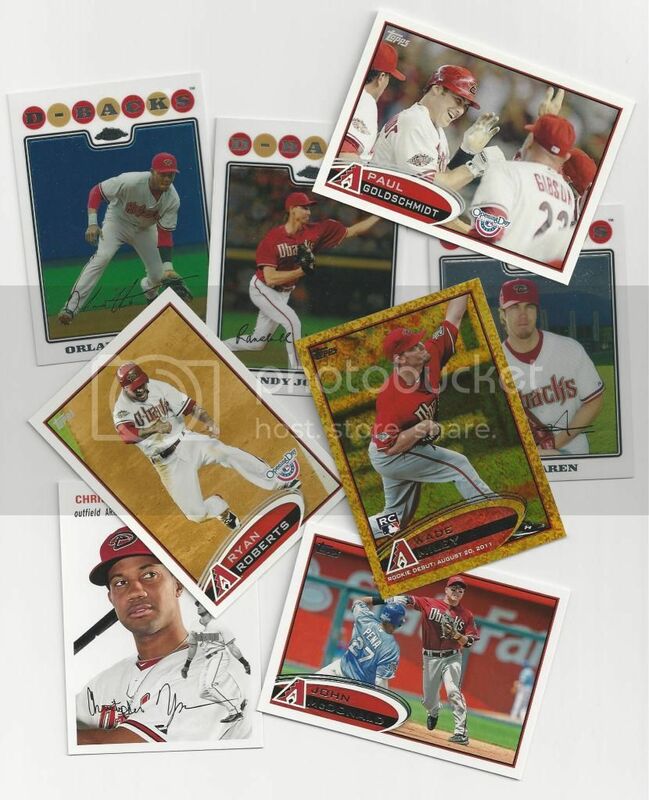 There are a few other Diamondbacks in that set that I was thinking about getting but now I'm not so sure. If you're not familiar with Chris Owings he is number 5 on MLB's top 20 Diamondbacks prospect list. Well it finally happened. The Diamondbacks have traded Justin Upton. My initial reaction was relief. Seriously. It's just nice that this drama is over. A lot of D-Backs fans are unhappy with this move and the players we got back. I'm more content than most. The way I look at it is whatever we had going on last year didn't work. Heading into the off-season Kevin Towers wanted to shake things up a bit. And shake he did. Gone are Arizona staples like Chris Young and Justin Upton as well as our top prospect, Trevor Bauer. In doing so we've gained a ton of prospects and Martin Prado. I'm optimistic that this will turn out well for us. At the same time, I hope Justin becomes a perennial All-Star in Atlanta. As I'm getting ready for Spring Training 2013, I'm looking back at some of the cards I got signed in 2012. 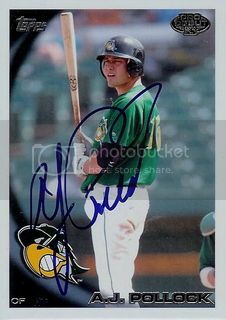 Aaron Heilman signed this 2011 Topps card for me over at the Seattle Mariners Spring Training complex last March. Aaron spent parts of the 2010 and 2011 seasons with the Diamondbacks. His time in Arizona was pretty unmemorable. Our bullpen was terrible those years and Aaron didn't do much to break that mold. Despite that I was actually excited to get this card signed. It was kind of a turning point in my Diamondbacks collection. 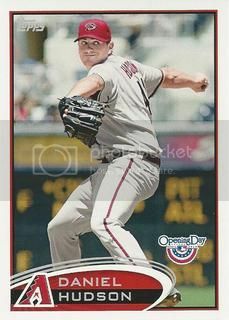 I realized that I wanted to try to focus on getting former D-Backs to sign their D-Backs cards. Not quite the "The Great Orioles Autograph Project" but something similar without the need to get everyone who has ever played in AZ. 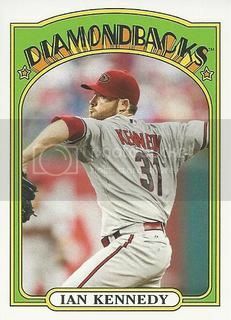 I came across a lot of 25 Diamondbacks cards on eBay. It had free shipping so I threw in a bid of just over a buck. When everything was said and done I had won. I didn't have high expectations but got just about what I thought I would. The seller sent a nice mix of players and brands. All of the big names were there like Randy Johnson, Curt Schilling, Eric Byrnes, and Matt Williams. I didn't have most of them so that was a pleasant surprise. My favorite is the 2004 Cracker Jack Steve Finley. 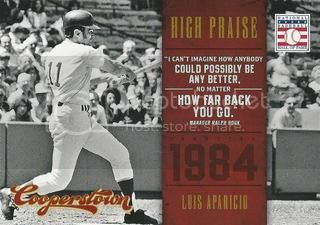 Luis Aparicio had three cards in the 2003 Bowman Heritage set. I remember this set when it first came out. I was more focused on getting the current players and the rookies instead of the legends. A few years have passed and some things have changed. I now own all three of the Lil Luis cards from this great, retro set. 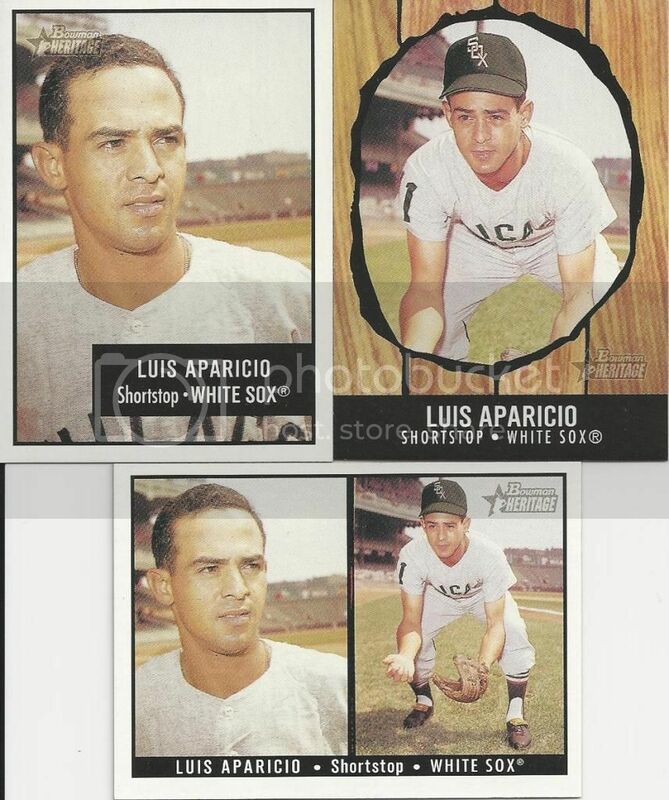 On a related note, I am slowly working on compiling a list of which Luis Aparicio cards we have. Eventually I would like to do the same thing for Daniel Hudson too. Stay tuned, kids! One of these days I'll be better organized. Another mystery package showed up in my mailbox this week. This one was from Wes at Jaybarkerfan's Junk. Inside were a few random D-Backs ( always appreciated ) and this amazing Stephen Drew jersey card. I hadn't seen this set before so I had to do some research to even find out what it was. It's from the 2007 UD SPX set and is numbered 170/175. There seem to be quite a variety of parallels for this one including another green version that's numbered to 15. I'm a little confused but all I know is that this card is awesome. Thanks, Wes! 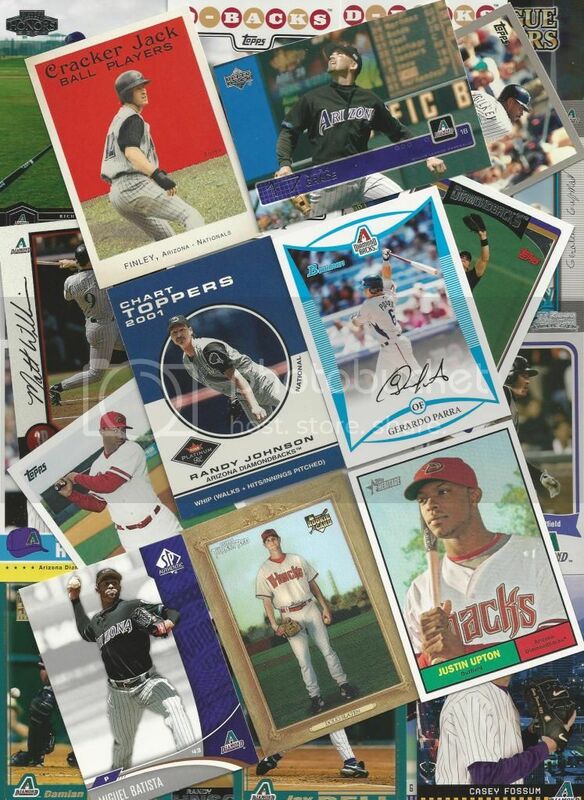 My new favorite eBay seller SIDELINES01 listed some more Diamondbacks Pepsi cards so I've been buying everything I can. I picked up 6 of the 15 cards from the 2000 set. I like the design on these too. The head shot mixed with a full body photo works well but I could probably do without the red, white, and blue Pepsi logo background. I remember getting a few of these out of a 24 pack back in the day. I'll have to dig them up and see if I have any different ones. Good news! I picked up another Luis Aparicio certified autograph for our Lil Luis collection. This one is from the 2012 Leaf Memories set. It features a sticker ( yuck! ) auto and a design reminiscent of the classic 1990 Leaf set. This one is numbered 24/25 on the front. I paid a little more than I wanted to but it was worth it for a low numbered card from an obscure set that will probably disappear off the market quickly. 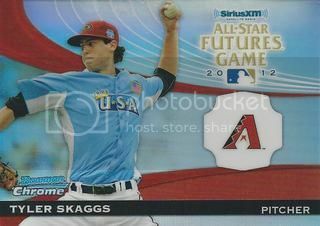 I didn't know exactly what I was getting when I bought this Tyler Skaggs All-Star Futures Game insert from the 2012 Bowman Chrome set of SportLots but I was extremely happy when it arrived. It's a really nice design and it's super shiny. I would be interested in the Alfredo Marte one too if anyone happens to have it. I stopped by my local card shop at lunch today and actually bought something. I try to stop by there once every few months but I usually don't find anything interesting. Actually my last purchase from them was over a year ago when I cleaned up on Mike Trout 2011 Topps Update rookie cards from their 4 for $1 box. I found this 2009 Topps Ticket to Stardom Kevin Kouzmanoff card sitting front and center in $2 relic/auto box on one of the counters. I've been semi-interested in this card for awhile now. 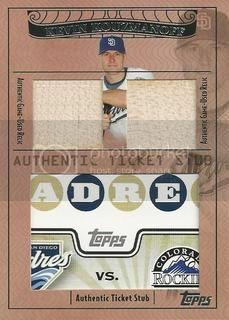 I like that the 2008 Padres season tickets featured the 2008 Topps design and they stuck part of one of those stubs into these cards. When I remembered to look on eBay for them, I can never find one that's not overpriced. These are numbered to 200 so there aren't a ton of them out there. Welcome home, Kevin Kouzmanoff. Your card will live on forever as part of our 2008 Topps collection. Brian from 30-Year Old Cardboard sent me an awesome package this week. 30-YOC recently celebrated a pretty major achievement. He's surpassed 8000 blog posts in less than 4 and a half years. He consistently puts out quality post after quality post. Sometimes to the tune of over 200 in a month. I don't do much more than that in a year. As a loyal reader/follower/friend, Brian wanted to surprise me with a card he knew I would really enjoy. 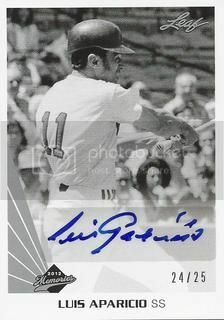 He did just that with this 2001 Fleer Greats of the Game Luis Aparicio certified autograph. 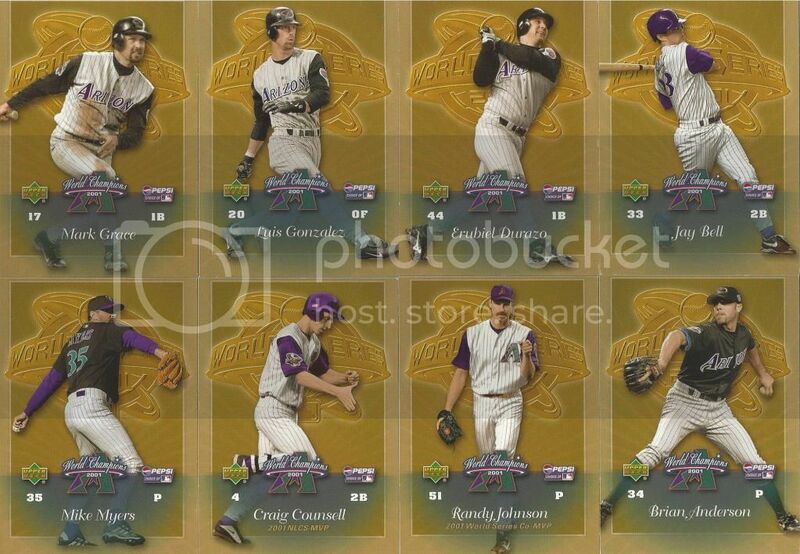 The 2001 Greats of the Game set is my favorite from that product's run. This one truly is great. It's got an awesome, unique photo of Lil Luis playing some Gold Glove defense, an on card signature, and a classic, simple design. Thanks, Brian! This one will always have a special place in our collection. One of my favorite blogs, Once a Cub, is trying to kick off a 2013 Fantasy Baseball League. Most likely it will be a standard 12 team Yahoo H2H league. For either a $15 or $25 buy in there will be some cool prizes for the winners. I'm planning on playing and it would be cool if you joined too. Click here for more details. 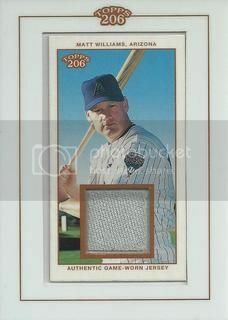 I got this Matt Williams jersey card for what I thought was a pretty good deal. It's from the 2002 Topps T-206 set and it only set me back $2. It reminds me of the Allen & Ginter relics that we'd all come to love just a few years later. I picked up this 2010 Bowman Chrome Topps 100 Refractor for our Daniel Hudson collection. I didn't even know they had refractor versions of these. It's numbered 65/499 on the back. A.J. Pollock is one of the Diamondbacks many outfielders. A.J. was a first round draft pick in 2009. He made his Major League Debut against the Pirates during a day game at Chase Field on April 18, 2012. I was at that game! Woo! Too bad we lost. A.J. 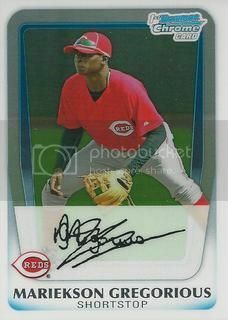 signed this 2010 Topps Pro Debut card for us during Spring Training last year. Oh Listia how I love thee. I got this Miguel Montero refractor for free off Listia. It cost me a few credits and was totally worth it. Refractors are one of the most awesome inserts ever and this one is numbered 88/199 on the back. Panini is doing some good things this year without an MLB license. I just picked up my third Luis Aparicio card from Panini's new releases. This one is from their Cooperstown set. It's a simple, unique design with a black and white photo of Lil Luis. I like the Hall of Fame logo in the upper right corner and the HOF induction date above his name. A great card all around. 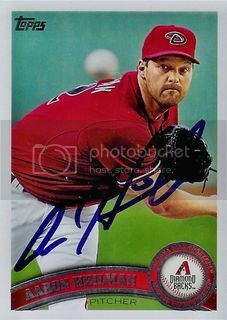 I'm glad to finally have card # 325 from the 2008 Topps set signed. It's of Detroit Tigers manager, Jim Leyland. For the past two off-seasons, I've seen people get returns from him and I keep forgetting to send him a request. Well this year I was determined not to miss out. 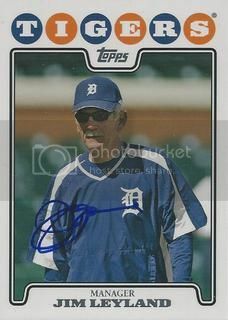 I sent Mr. Leyland a request a few weeks ago and my card came back signed over the weekend. Leyland is a potential Hall of Famer. He led the Pirates to three straight division titles back in the 90s. He won a World Series in Florida in 1997 and he's won two AL Championships while in Detroit. His win loss record is right around 500 but with another title I bet he gets in. 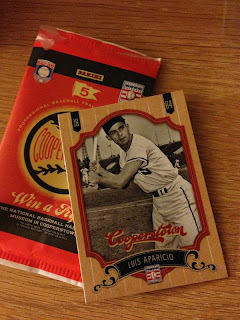 I paid a little more than I would have liked to for this 2012 Panini Golden Age Stand Up for our Luis Aparicio Collection. Once it arrived I don't regret my purchase one bit. These cards are really cool. 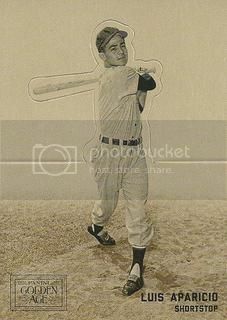 They're similar to the 1964 Topps/2011 Lineage Stand Ups but this one has a sepia tint that works well for a retro set. 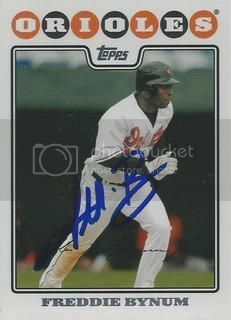 Awhile back Justin from Justin's World sent us this signed Freddie Bynum 2008 Topps card for our set. I remember when Freddie was coming up in the A's organization about ten years ago. According to his Wikipedia page, he's still defending the faith in the Atlantic League. 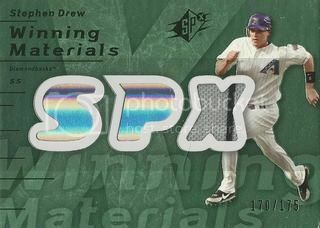 The best card that Night Owl from Night Owl Cards sent me was this Daniel Hudson from the 2012 Topps Opening Day set. I didn't have this one yet so it will go right into my Daniel Hudson player collection. Thanks again! I recently completed my first trade with the baseball card blogger legend who calls himself Night Owl. I sent him a Matt Kemp SP and he sent me some D-Backs. They're all great but I really needed the Wade Miley parallel. He sent along some 08 Topps Chrome. Those are always appreciated too. Thanks, Night Owl! 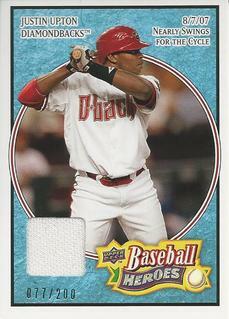 I figured I needed a card of the newest Diamondbacks prospect, Didi Gregorious. Didi is the shortstop we got from Cincinnati in the three way deal that sent Trevor Bauer to Cleveland. I still don't love this trade but I'm trying to be optimistic. Prove me wrong, Didi. Prove me wrong. I've had a ton of imaginary money burning a hole in my fake pocket on Listia. I've had a hard time finding anything that interested me that was selling for a good price. 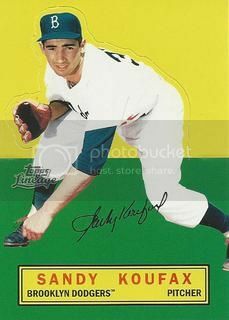 That is until this Sandy Koufax Stand-Up popped up. This one set me back a grand total of 8 credits. I couldn't be happier. I really liked this set but I never picked any of these up until now. Still not on Listia? Click here to sign-up. You'll get some free credits, I'll get some free credits. We'll all be happy. 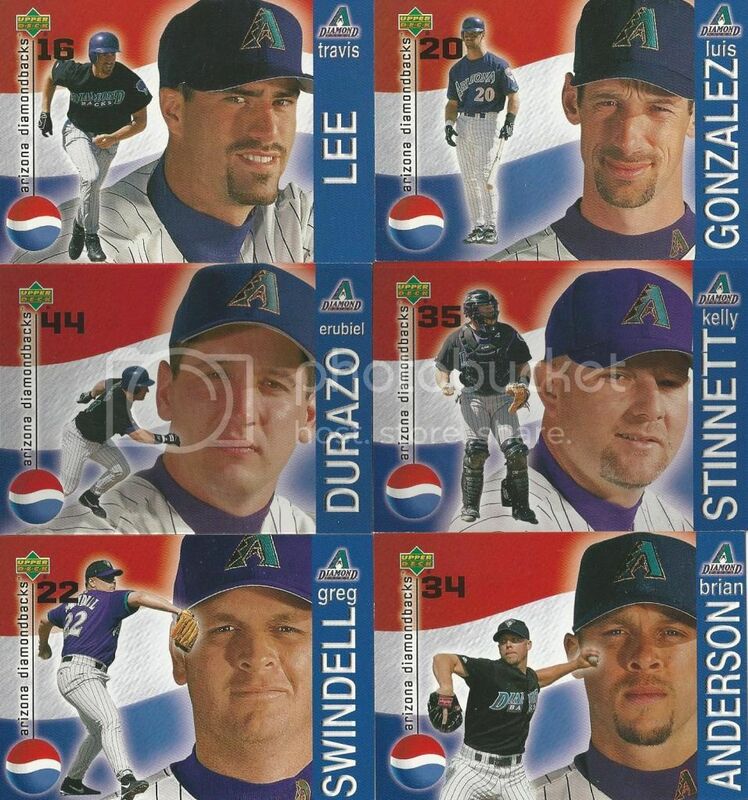 I contacted the seller who had the Danny Bautista card from the 2002 Upper Deck Pepsi set to see if he happened to have any others. He did! With the 8 below, I now have 9 out of the 15 cards in this set. There's some big names here like Mark Grace, Luis Gonzalez, and Randy Johnson. As well as a few fan favorites like Erubiel Durazo and Craig Counsell. The seller ( SIDELINES01 ) was really cool and gave me a great deal. Check out his eBay store for some great cards. Plus he's got some really cool pennants and license plate frames. All at amazing prices. After lunch today I went to Target to pick up a few things. I haven't bought any packs of cards since Topps Update came out and I felt like opening something. They had a few packs of 2012 Panini Cooperstown left so I grabbed two. 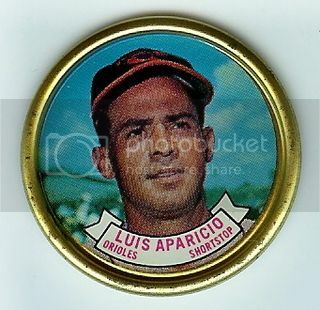 I knew there's a base Luis Aparicio in that set and a few inserts too. As I'm walking to the register I realize spending $6 on two, five card packs isn't too good of use of my money but by then I had come too far. The good news is I got the Lil Luis card I wanted! I like it when things work out. Sure I could have bought it elsewhere for about a buck but where's the fun in that? I posted this on Twitter a little while ago and figued I'd use that same picture rather than taking the time to scan the card. Hello, 2013! I'm so over making goals. Let's just talk. 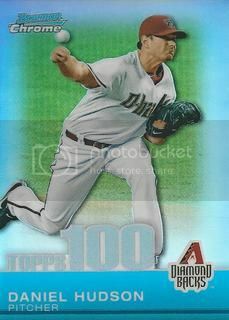 I'm optimistic that 2013 will be a good year for My 2008 Topps Set Blog. Better than last year. You're probably wondering, "Hey Moe! What does that mean???" Nothing too crazy really. Just more of what I hope you've come to expect. You'll get some new Daniel Hudson cards for our player collection. 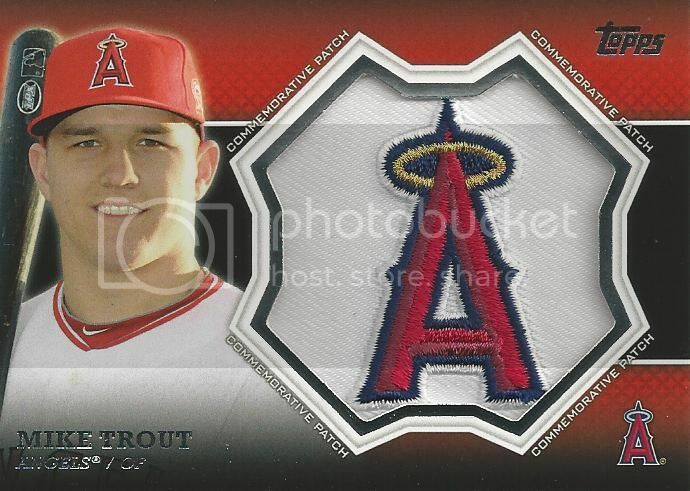 It seems like Topps threw him on every certified auto checklist last year so we'll see if that continues in 2013. 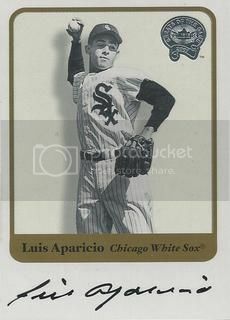 There will be some more Luis Aparicio cards. Expect both new and old stuff. If it's Lil Luis, I want it. I'm also planning on growing and organizing my Diamondbacks collection. I'm really enjoying being a D-Backs fan right now. I went to more games last year than ever before and plan on attending a bunch again this season. There will be a few surprises too. I'm kicking around the idea of a Hall of Fame collection. And does anyone remember the 2002 Fleer Maximum set? I do. I'll give some more details on those two later. For now, let's all enjoy the new year! It's only a few weeks until pitchers and catchers report.